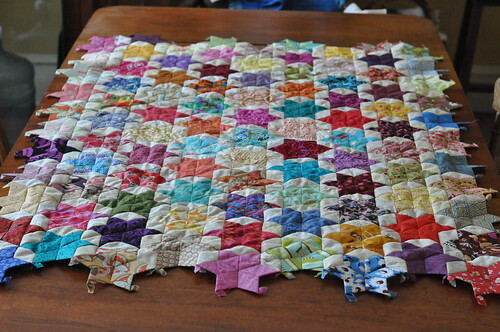 2010: The year in quilts, originally uploaded by Shadrach Meshach & Abednego. Further adventures in Kaleidoscope Land - I am looking forward to trying out the Marti Michell Kaleido Ruler and comparing it to the Smart Plate. This last may be made easier by the rise of cotton prices. 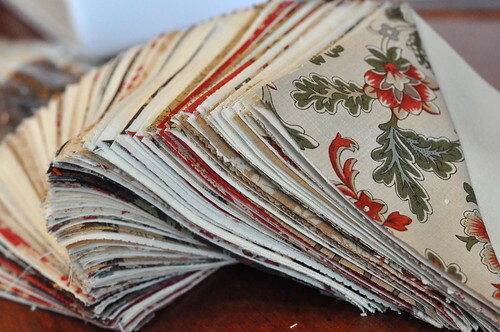 Deborah of Whipstitch wrote a very clear and thoughtful post about the cause of the rise in prices and the effects of this on the LQS owner and on us as consumers and quilters. She talks about prices going up $.60 a yard in her shop, and I have read others report increases as much as a dollar a yard. I'm sure that seems like a lot, but as a Canadian, it puts yardage still well under the average price that we pay here, in the neighbourhood of $15 per meter. (It is true that a meter is bigger than a yard - but not that much bigger!) And so, as long as the exchange rates hold, it will still be more economical for us to buy online from American stores. Of course, it's important to remember that economy is, or -- from my perspective -- should be, only one element that factors into our decision of where to buy fabric. 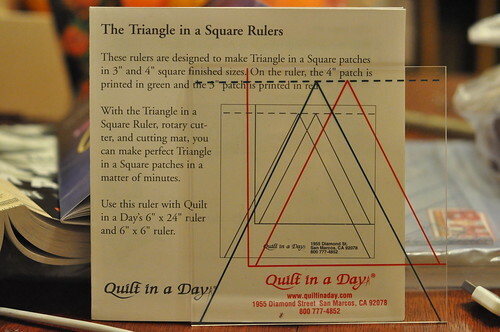 I am curious to know whether or how this will affect your buying and quilting habits this year. What do you think? P.S. Thanks so much for the love about the kaleido finish I posted about; it truly made me feel so much better. 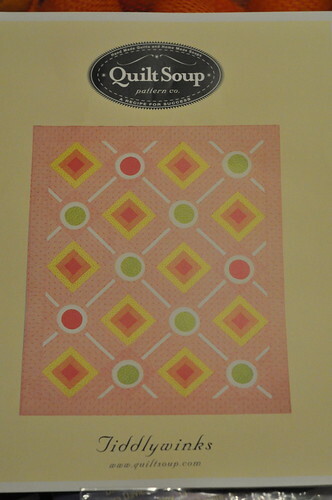 I have decided to definitely send it out to a LA-er, and I am feeling very hopeful that this will redeem the quilt and make it into the beauty I know is inside it! Before I get to the business at hand, just a quick pause to show off my lovely daughter and one of my two gorgeous dogs! Eve is certainly going to miss her fur sisters when she goes off to university next fall! (2) Don't know what this layout is called officially, but I have been thinking of it as Lattice Diamonds (ignore those random blocks along the left side). So what do you think is the nicest? I'm sure there are other layouts that I didn't try; for example, the barn raising layout with concentric diamonds radiating out from the centre. I'm not terribly fond of that one, so I didn't bother with it. But if there are others that I should know about please do say! P.S. Thanks, all of you, for that bunch of wonderfully encouraging comments on yesterday's post when I was feeling so blue about that quilt top. I've got a line on some long-armers, and I'm filled with renewed hope! I have never been so happy to finish a quilt top as I am with this one. And it's a puzzler. I can't decide how I feel about it. I put it on my bed and it looks fine, nothing wrong with it. 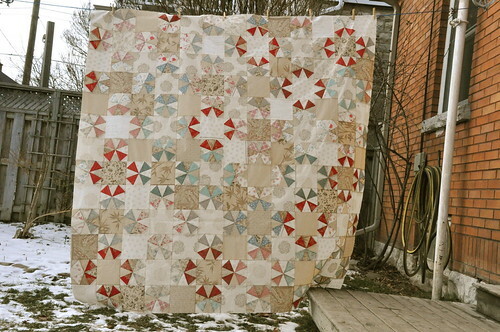 But for the amount of blood and tears that went into this quilt, I expected more than fine. It is mostly Rouenneries and Lumiere de Noel by French General, but there are some other random fabric lines making an appearance, as well. The top finishes at 72" x 78". 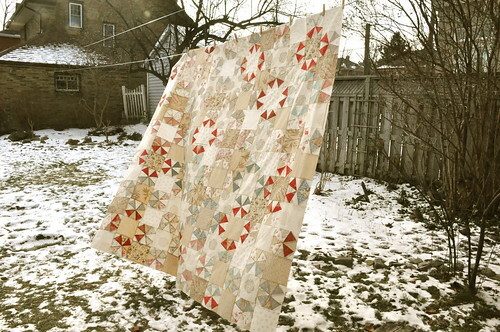 It's funny, but it seems to be a quilt that looks better in photos than it does in real life. 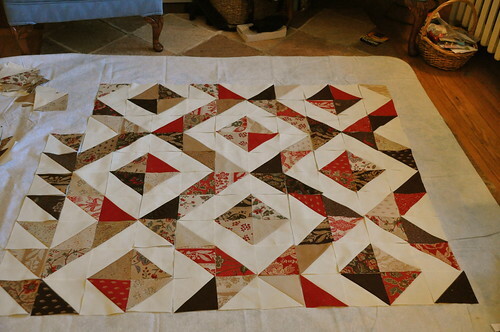 I may consider sending this one to the long-armer (if I can find one that I trust, having never used long arm services before), in the hope that expert quilting can turn this ugly duckling into a swan. 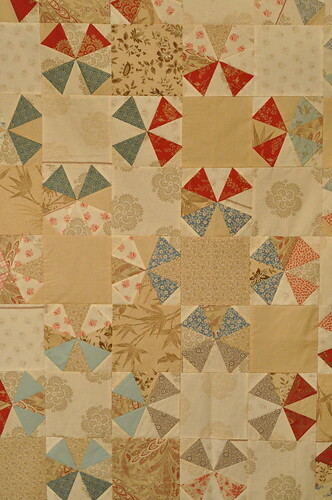 Finishing this kaleido flimsy was at the top of my list of holiday sewing goals, so I am pleased to have it completed. 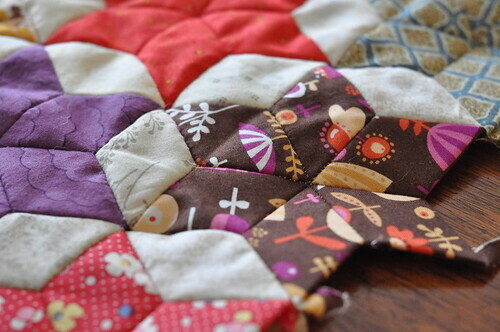 Second on my list is quilting the Paprika quilt that has been sitting around for far too long. I have the wool batting, King Tut thread and the fabric for the backing all at hand. 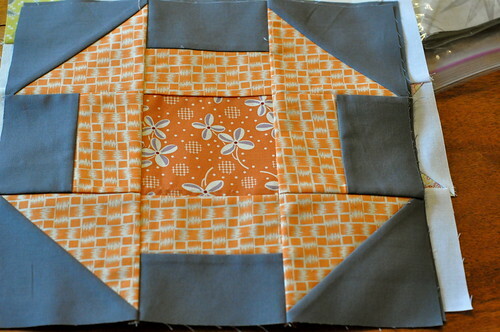 Third on the list is a late entry: a quilt for a friend in need. A few days ago I caught up with a friend on the west coast who has had a very difficult year, a crushing, soul-crippling year. 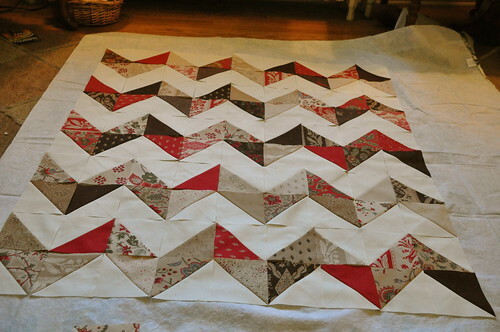 Being far away, what can one do but make a quilt? 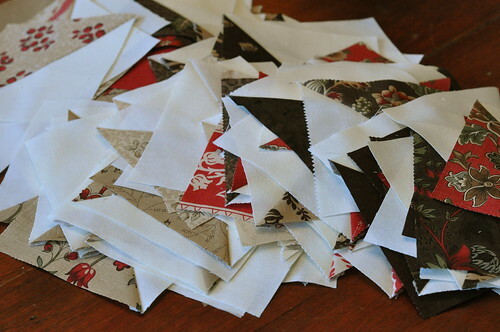 Wanting to make something quickly, I found some charm packs in my stash: two Maison de Garance packs and two Moda Bella packs in Snow, and I turned them into HSTs. I have yet to decide how to lay them out. HSTs are so versatile, aren't they? I'll lay out some options and show them in another post. 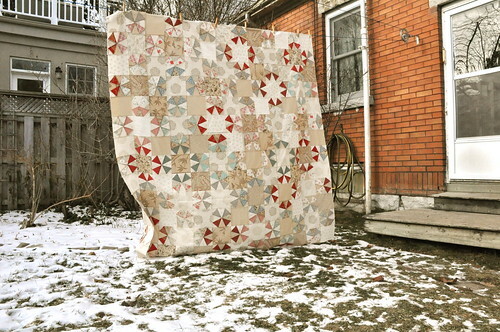 Oh lordy, this kaleido quilt will be the death of me. 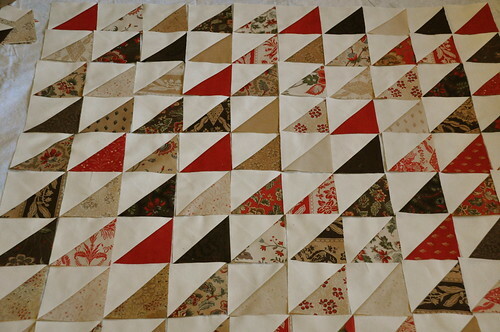 I spent the weekend finishing off the blocks for this quilt and starting to assemble the quilt top. My design wall is a vinyl tablecloth that I pin to the living room curtains, and it was only big enough for half the blocks. Since the pattern is so fiddly, and I have drafted it carefully on a piece of paper with all the colours marked, it didn't really matter that I could only see half the blocks at a time before I started to sew them all together. Last night I was feeling pretty blue about how it was coming along. I felt like the primary pattern of these star points weren't emerging the way I hoped they would. 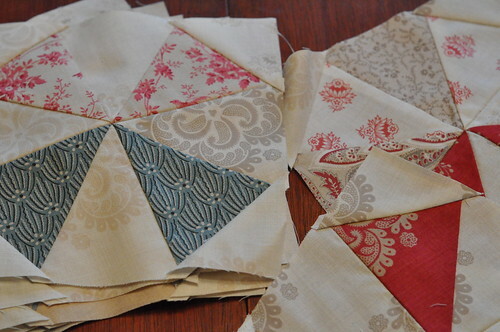 I was starting to feel like it was just going to look like some random scrap quilt. But in the photos, I see the rings a lot more clearly. Why is that? I'm kind of liking it again. See how the primary pattern of the rings of star points are composed of four different blocks? This means that things have to be sewn together very carefully. 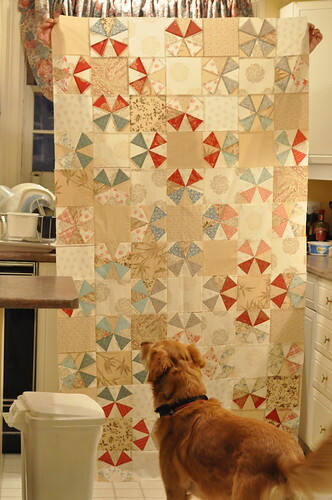 I like to chain piece the heck out of things when I am assembling a quilt top, but I just couldn't do it on this one. 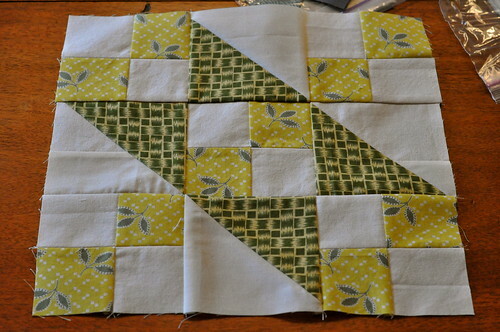 When I tried to, I made so many mistakes, sewing the wrong sides of blocks together, etc., that I finally just limited it to joining up three pairs of blocks at a time. 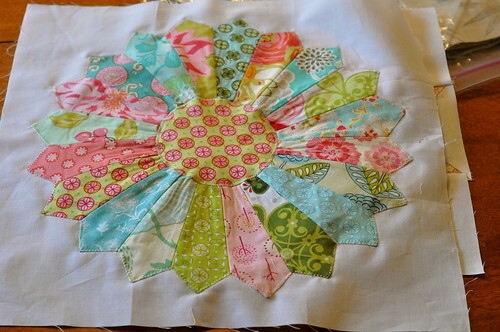 Who said quilting was a sedentary activity? 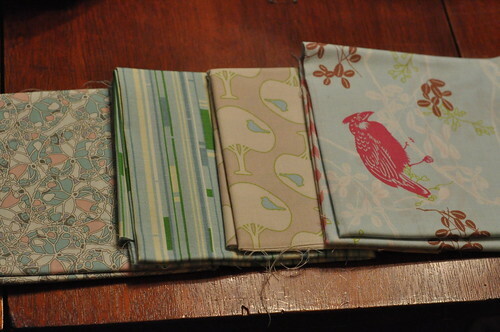 I must have walked my 10,000 steps just going from the design wall (living room) to the sewing machine (dining room). 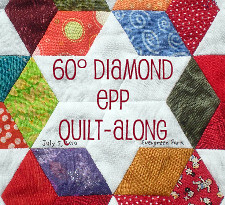 I've also been beetling away on my EPP diamonds, and I'm happy to report that I've gotten that sucker squared up, at last. Well, perhaps rectangled-up is more accurate. 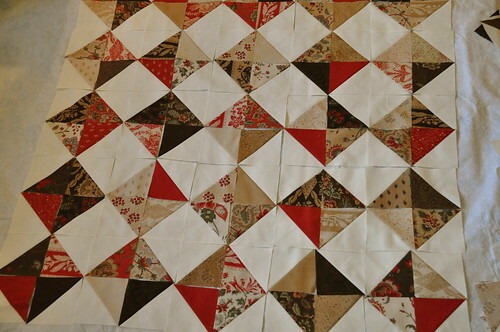 It's great to have a hand-piecing project - this one is about 1/3 done, probably. As it gets bigger, it's harder to handle, and I worry a bit about the weight of it pulling on the stitches. Also, in other news, I am thrilled to have my clock back from the repair shop. This clock is a fixture of my childhood. My grandfather worked for the Bureau of Mines in the US government and moved around a fair bit. I remember where this clock was in all of their homes. It came from his family home. He was born in 1906, in Marion, Kentucky. 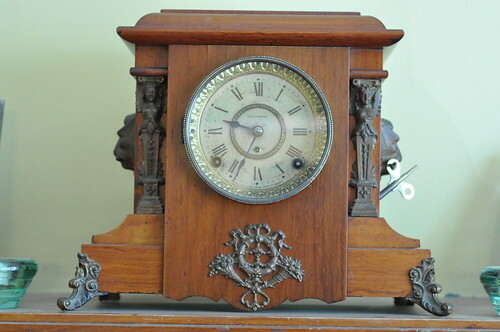 Every room in the house had a clock, and this clock was in on the mantel in the room where the boys would dress in front of the fire in the winter. Well, it was with my mother after her parents passed, and now it is with me. The clockmaker has had it for awhile, cleaning it and getting it up and running again. When we wound it up and it started ticking, I became all weepy for days gone by - it has a lovely deep chime on the hour and a sweet feminine ding on the half hour. The random number generator was pressed into service, and it returned K@ren's name, whose dream job is to have a fabric store. This was a very common dream job, and I wish it would come true for all of you! I was also captured by Sherri's dream job, which is to be a professional dog kisser. The hours for that job match nicely with those required to be a professional napper, so I think I will take that up, as well. 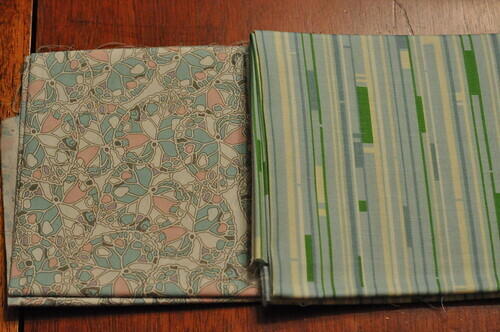 So I'll drop a bonus couple of FQs into the mail for Sherri. Thanks for playing, everyone, and a warm welcome to you new followers. 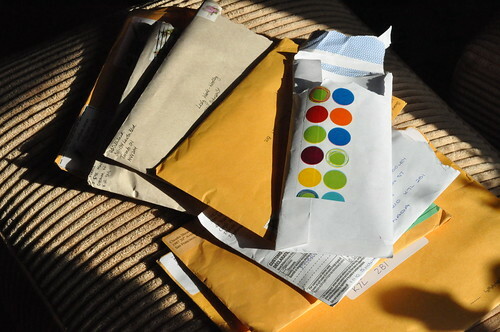 I didn't win anything from the giveaways I entered, but never mind - I am slowly making my way through the comments left on my giveaway post; finding new blogs to read and meeting new people is the biggest prize of all! 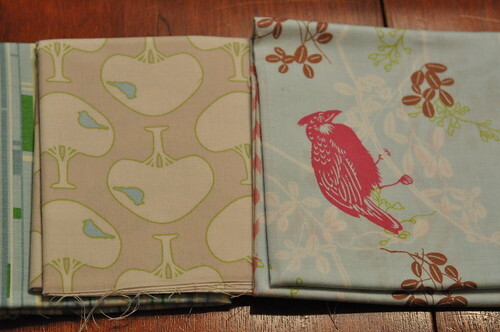 Sew Mama Sew giveaway loot, originally uploaded by Shadrach Meshach & Abednego. 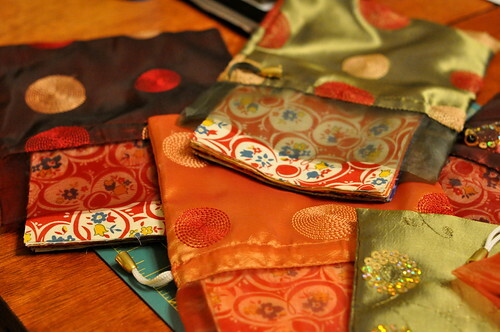 I would also like to remind you that I have just started a Flickr group for swapping quilty goodness like patterns, rulers, tools, fabric, etc. 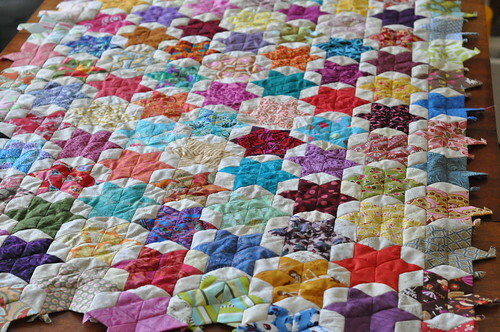 If you have things that are duplicates or that you aren't using anymore that you'd like to swap, come over to the Quilters' Exchange group and add your goods to the pool! Now, for this giveaway, please leave a comment below, telling me what your dream job would be. Mine is professional napper - I am an excellent napper, and if I could get paid for taking naps, I would be a millionaire: that's how good a napper I am. So let's hear from you. Comments are open until December 17, and it will be the standard random draw. Pork Chop Swap packs!, originally uploaded by Shadrach Meshach & Abednego. I am a very peripheral member of a Flickr group called Old Red Barn Co. 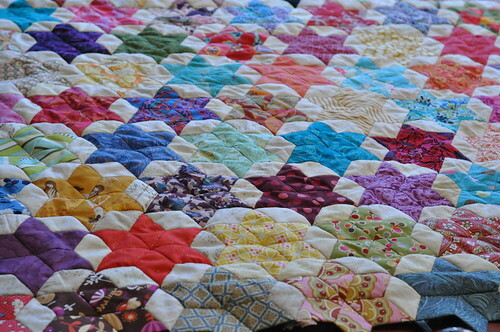 It's a very lively, chatty group that does quiltalongs at a rapid pace and periodically has swaps of different kinds. Earlier this year, I participated in one where I swapped packs of 25 different 5" squares with seven other women. I'm still hoarding them, and I have added to them over the year. I jumped in when they announced another swap last week. I am thinking ahead to next year, when my daughter takes Wine Gums away to university; I'd like to have a similar one to take its place. So I'm collecting these 5" charms in preparation. When my swap partners send me theirs, I will have 175 new ones to add to my hoard! 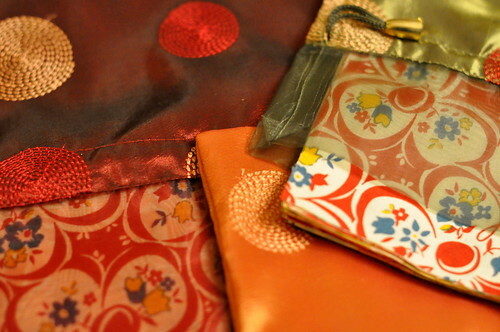 I had to share these photos of the charms in the dollar store satin bags I picked up. They make the charms look like treasure! I hope my swap partners will be happy! Extra stuff - let's swap! Today I want to talk about extra stuff. 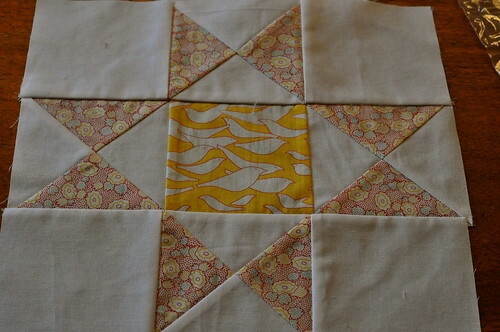 I'm not normally someone who goes for the less is more approach to most things, and this includes quilting. But from time to time, one does tend to end up with extra stuff. In my case, I inherited quite a few specialty rulers and loads of fabric from my mom when she passed (not to mention cross-stitch patterns and enough embroidery thread to go to the moon and back a couple of times). After I made the Christmas wreath that my mom had started as a mystery project from a Quiltmaker's magazine, I was contacted by a reader who was wondering if I could be persuaded to part with the issues so she could make a similar wreath. No problem! I was very happy to think that someone else could benefit from my mom's magazines. When I was in Texas, I went to The Old Craft Store in Carrollton. It was a cute little store with a post office inside! 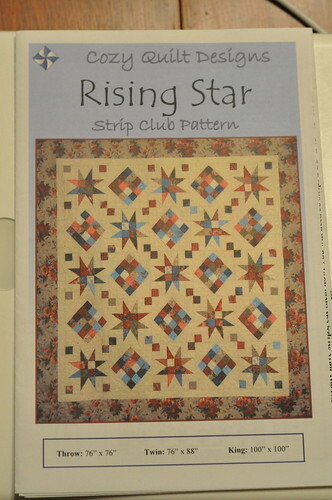 I wasn't turned on by the fabric, but I found some great rulers, including the Rapid Fire Hunter's Star ruler by Deb Tucker. 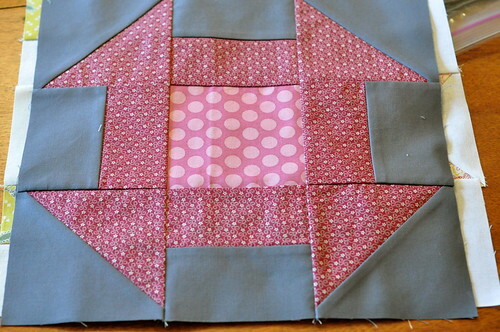 I really like Jackie's quilt using this ruler, so I was thrilled to find it. I also got the Easy Angle and the Companion Angle rulers for making HSTs. 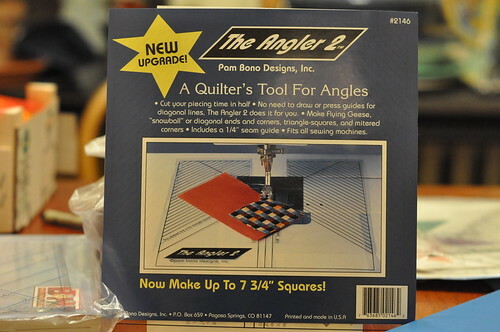 But when I got home, I went to get the magazines out to send to Karen and I started looking at through the box of my mom's quilting things, and didn't I find the Easy Angle and the Companion Angle! I could have kicked myself! I also found a duplicate HST square-up ruler. Argh - how frustrating! Who needs duplicate rulers? It occurred to me that it would be great if I could swap these rulers for others that I would use. Or maybe for patterns, or other notions. Why should I hang on to patterns like the Christmas wreath pattern or other patterns I have already made up when others might be interested in them? So here's what I suggest: an online swap meet. 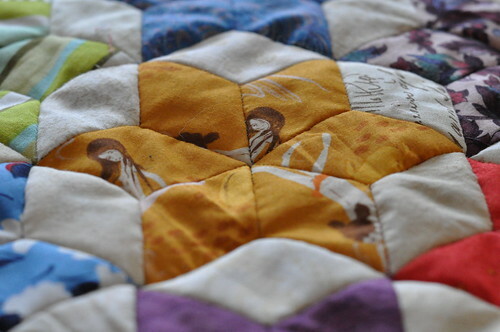 Go to this Flickr group, Quilters' Exchange, to see what I have to swap and if you have some things you're ready to give away, take some photos and add them (you have to join the group first). I've got some more things to add, like the Fons and Porter magazine issue with the Paprika pattern in it (I promise I will quilt this baby over the holiday - I already have the wool batting). 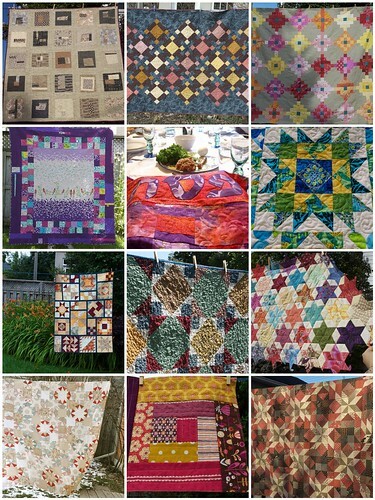 All the photos in this post, plus some other great swag, is listed on the Quilters' Exchange page at Flickr. 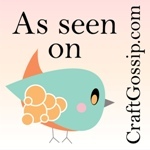 Go look and see what you think! This is a shameful photograph. It displays my bee blocks in arrears. 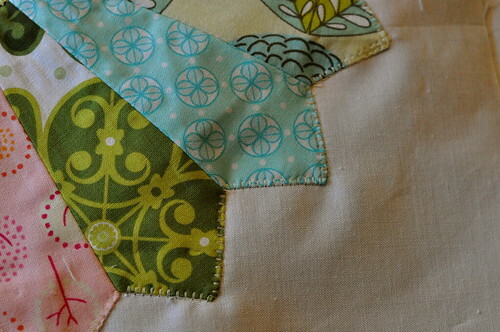 But this weekend was a sewing weekend for me, and I managed to catch up almost entirely on those blocks. and Madeline's Dove in the Window. 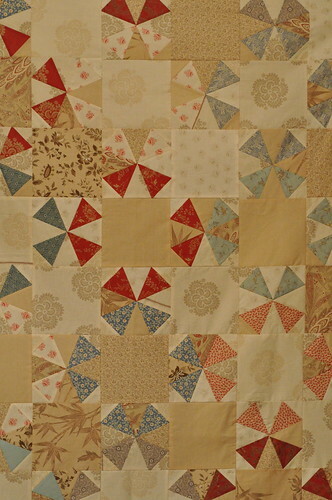 For the Maple Leaf Bee, Austen gave us quilter's choice and some Hope Valley fabric. Her fabric was strips about 4 3/4" x 20" wide, so it made it surprisingly difficult to find a 12" block that could be accommodated; you couldn't use a 6" patch or even make a 4.5" HST. 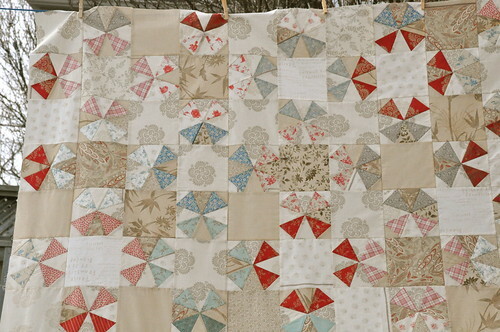 But I found this Jacob's Ladder block that fit the bill, even though I had to supplement with extra white fabric. I also made Ariane's Dresden Plate. It was the first time I'd made one of these. 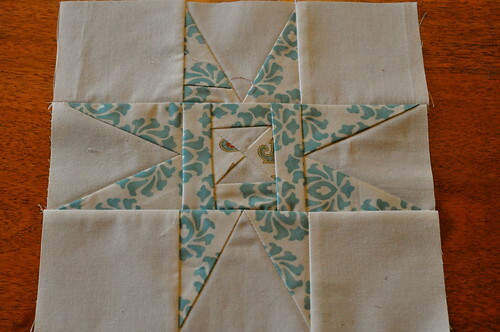 I used the zigzag stitch on my machine to sew down the centre circle, but I wasn't 100% happy with the way it looked. So I took a chance and used the blanket stitch setting on my machine to sew down the petals, with much better success. And for the Modern Tradition Bee, I made these two churn dash blocks, from a dark grey and Hope Valley. I like this colour combination a lot - and from the blocks the others have made, I think this is going to be a knockout quilt. I'm very nearly up to date, although not entirely. 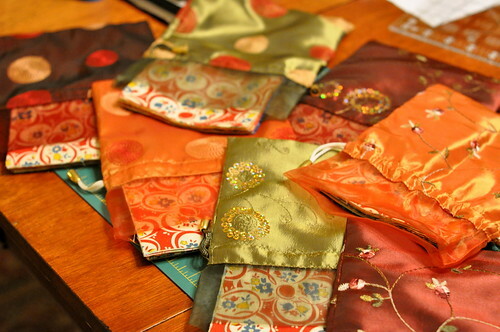 But I did feel like I had earned the right to sew for myself a bit the next day. 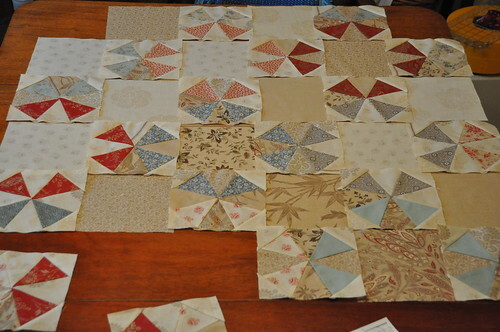 On Sunday, I finished all the pinwheel blocks that are the foundations for the kaleidoscope blocks on my current project. I'll show a photo taken previously, since it's been so long since I've posted about this project - you may have forgotten all about it! It's early this year, isn't it? Wow! 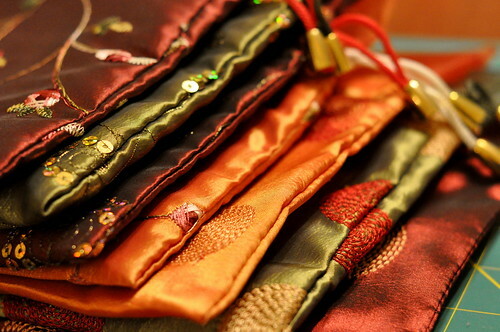 Chag sameach to all the quilting MOTs out there - all five of us - lol!